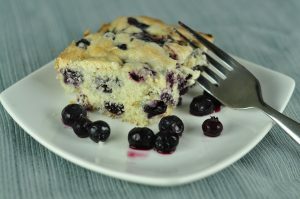 This easy recipe for Buttermilk-Blueberry Breakfast Cake is an amazing way to start the morning! It is super moist, can double as a dessert, and is loaded with fresh blueberries. Buttermilk seems to make everything better. 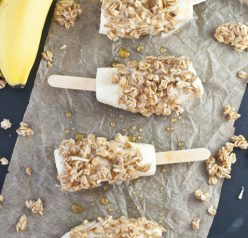 This is a simple cake-like-but-not-dessert-like recipe to make for a morning treat. You will fall in love with this Buttermilk-Blueberry Breakfast Cake. Have you heard of Pinterest? If not, you are totally missing out. If you have heard of it, then you probably know it is by far the best place to find new and interesting recipes to try and that is where I found this recipe. I always said I would never join the Pinterest community because I feel like I have “too many things to check and keep up with”, but I got sucked in recently. The first day I joined I fell down the black hole and it took me days to emerge. It is very addictive! I am more of an observer than an actual “pinner”, however. Mr. Wishes happened to take a look at my Pinterest page yesterday and rendered it “boring”. He had the nerve to say I went overboard with the New York Yankee pins. Could that even be possible? I guess that permits me to spend some more quality time catching up on some less-boring pinning this week. 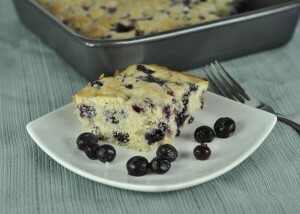 I loved this Buttermilk-Blueberry Breakfast Cake for many reasons. First, any cake that demands to be eaten at breakfast time is alright with me (and can be enjoyed with your morning coffee). Secondly, I like the intricacy that results as a combination of the blueberry and lemon flavor. And third, I just love cake! It is a super moist cake so it will stay good if you have to make it a day ahead of time. Of course, as with all sweets, it’s best the day it’s baked. Definitely put this on your t0-bake list! 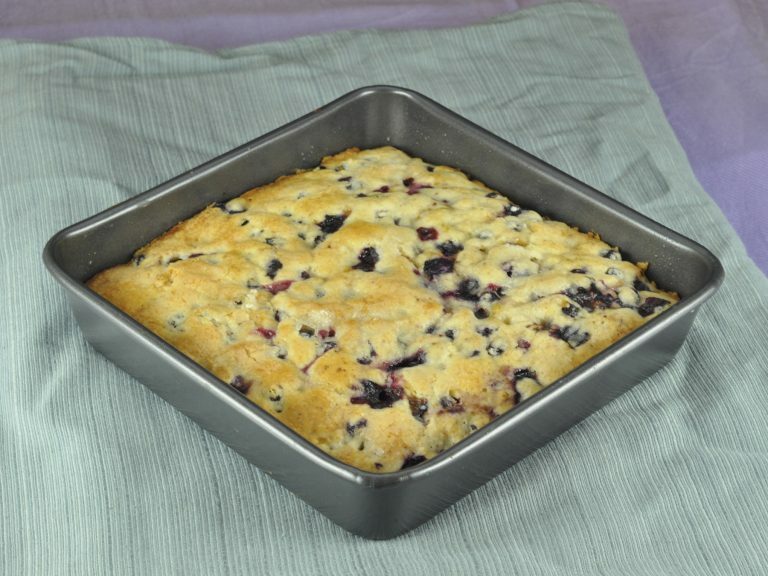 This easy recipe for Buttermilk-Blueberry Breakfast Cake is a great way to start the morning! It is moist, doubles as a dessert, & loaded with blueberries. Cream butter with lemon zest and sugar (3/4 cup + 2 tablespoons) until light and fluffy. Meanwhile, toss the blueberries with ¼ cup of the flour, then whisk together the remaining flour, baking powder and salt. Add the flour mixture to the batter a little at a time, alternating with the buttermilk. Grease a 9-inch square baking pan (or something similar) with butter or non-stick spray and spread the batter into pan. Sprinkle batter with 1 tablespoon of sugar. Bake for 35 minutes. Check with a toothpick for doneness. If necessary, return pan to oven for a couple more minutes. Let cool 15-20 minutes before serving. 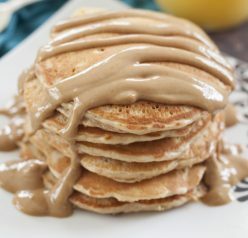 Old-Fashioned Peanut Butter Pancakes + BIG ANNOUNCEMENT! Love pinterest! It’s an endless pit that I’m completely obsessed with. I always find great recipes, like your breakfast cake! Looks and sounds incredible. I’d eat that for breakfast, then an after lunch snack and again for dessert. And there can never be enough Yankee pins!! I completely agree! Thanks for the comment!! Oh, yeah, Pinterest has got hold of me 🙂 Great cake with great flavors. Mr. Hungry Couple would eat this whole thing for breakfast! I don’t seem to have the patience for elaborate baked creations so a simple recipe like this is worth holding on to. Thanks. Yum! This would be a great brunch item. I like using buttermilk in baked goods, the cake becomes so moist! Oh my that looks light and fluffy and welcoming. Maybe I won’t wait for brunch. Maybe I’ll just have it for dinner. I didn’t wait either! I had it for a bedtime snack, as well 🙂 Thanks for the comment, Claudia! This looks so good, I love that there are two whole cups of blueberries in there. I think I could have this at any time of the day. Can’t go wrong with blueberries 🙂 And buttermilk totally does make everything better! Amen to that! 🙂 Thanks for commenting! 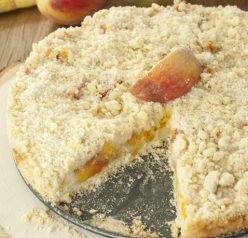 Thankyou for submitting this great recipe! It looks so good and so easy! I’ll be making this soon! Also, I think it would be fun to use mixed berries, too! I want to make this but I don’t think that my family can finish this all at one time, do you think the left over’s can be frozen? Sorry for the late reply, Kelly! I definitely think it can be frozen – just make sure it’s wrapped well/tightly! Made this for Christmas breakfast! The person bringing the “bread” dish ended up coming empty handed and I was able to mix this up quickly! Really delicious. I might make it again tomorrow but with chocolate chips instead. Can you use canned blueberries? I wouldn’t because of the added sugar/syrup.